Bonsoir a tous, et bienvenue a la Fete de la Musique à New York! 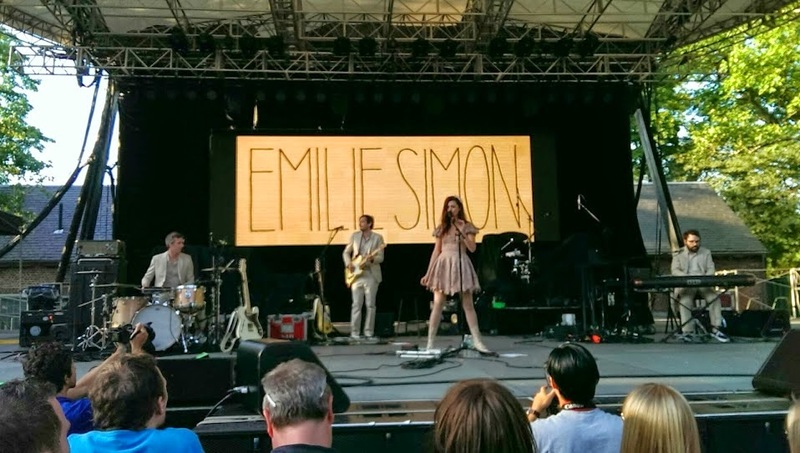 Such was the summer solstice performance at Central Park's Summerstage where French artists, Emilie Simon and M brought a bit of je ne sais quoi to New York. Begun in 1982, the Fete de la Musique aims to make music free and public, with amateur and professional musicians encouraged to perform in the streets. New York managed to accomplish both mantras by providing the concert as part of the Central Park Summerstage Music Festival. The first artist was Emilie Simon, a singer-songwriter with a bit of electronica and a bit of bubble gum in her tunes. Her look reminded me of Zooey Deschanel - a woman whose age was showing and trying to cover it up with a bow in her hair and a pink tutu. Most of the songs sounded the same, like something reminiscent of Chinese Peking Opera, with titles like "Flowers", "Les Etoiles des Paris", "I Call it Love" - you get the idea. Halfway through her set she brought out a very interesting contraption which she affixed to her arm. This device, I learned, is called Brissot Radio Acquisition For A Cappella Hand Selector (BRAAHS), and appeared to echo and distort her voice. I'm not sure how it worked (or if it really worked) but it made her look like a steampunk doll. 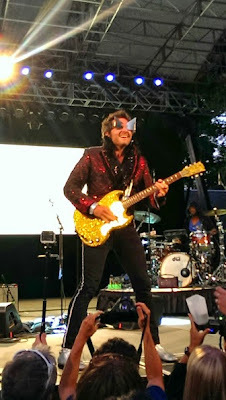 The main attraction for the evening, -M- (Mathieu Chedid) entered the stage with his signature -M- shaped glasses to kick off the song "Onde Sensuelle". He was accompanied by two very talented band members, a guitarist outfitted with a guitar/MPC/ipod instrument and a drummer with a set of pipes, whose names I am unfortunately unable to find online. He said that it was his first time in the United States, having only coming as close as Canada before. It was very exciting to be part of such a momentous occasion with an artist of his caliber. He couldn't come to New York and not play his biggest hits. The evening was anchored with all of the favorites: "Je Dis Aime", "Mama Sam", "Amssetou" and "Machistador". At one point, -M- left the stage and we experienced an interlude of "Hammertime" to "Jump Around" to "Killing in the Name" to "Seven Nation Army" to -M-'s triumphant return to "Le Complexe du Corn Flakes". 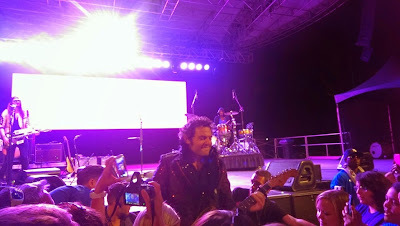 There was plenty of audience engagement as well. He brought a group of kids on stage to sing "La Seine" with him, a song from the animated film, "A Monster in Paris". 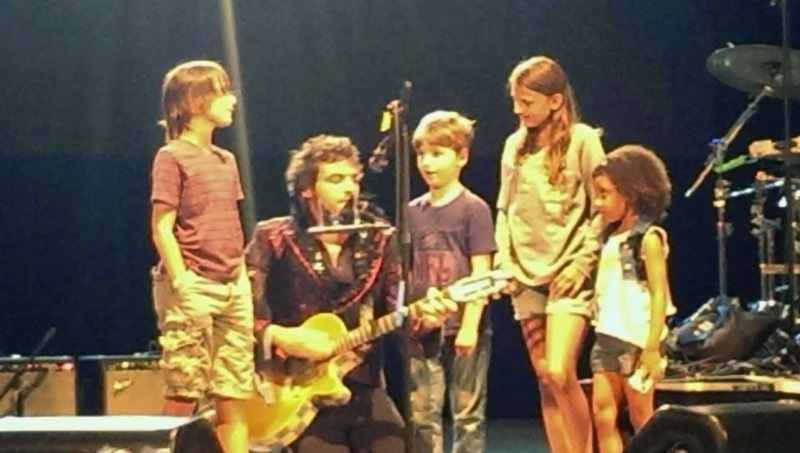 At another point in the show he disappeared for a good ten minutes deep into the crowd of Francophones. The show could have kept going through the night but unfortunately they had a strict curfew of 10pm to keep the old French folk of the Upper East side content.